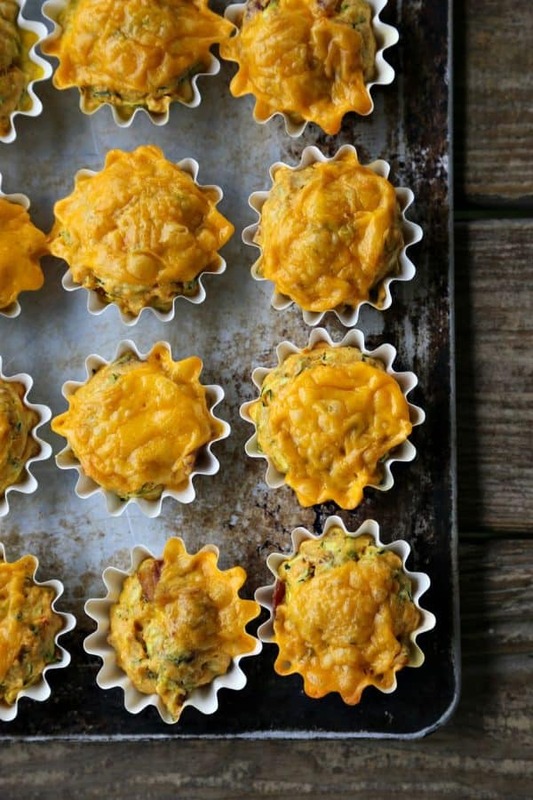 Tender, shot through with crispy bacon, heavy on the eggs, moist with scads of shredded zucchini and topped with a generous cap of melted Cheddar cheese, these Spicy Bacon Cheddar Zucchini Muffins bridge the gap a quiche and a muffin. They’re terrifically easy to make, take advantage of the current glut of zucchini from gardens, and freeze like a dream, making them a wonderful make-ahead breakfast option. Because they’re egg-centric, they have a longer freezer life than a standard floury muffin. Imagine rolling out of bed on a busy school morning and having a stash of these in the deep freeze waiting for you. Breakfast in as much time as it takes to reheat in the microwave, toaster oven or oven? Yes, please! I know they’re called ‘breakfast muffins’, but I don’t mean to dissuade you from eating them all the live long day. 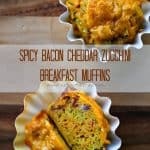 Spicy Bacon Cheddar Zucchini Breakfast Muffins might just as easily have been called “any time muffins”. If you pair these with a salad, they make a lovely light lunch, too. They’re eminently snackable, so they’d make a great after school snack or mid-afternoon nosh. Spicy Bacon Cheddar Zucchini Breakfast Muffins are so satisfying. They fill you up without making you feel like you swallowed a pound and a half of hockey pucks. I shred my zucchini on the largest holes of a box grater. I don’t want the zucchini to “disappear” in the muffins since they’re a savoury muffin. Anything smaller and it kind of “melts” into the muffins. Please don’t use extra virgin olive oil in the Spicy Bacon Cheddar Zucchini Breakfast Muffins. It’s too strongly flavoured and it’s really meant more for raw applications than baked ones. Use light olive oil or grapeseed oil. Light olive oil doesn’t mean low fat, it just means it’s been refined to have a higher smoke point and it’s better for baking! I prefer to cook my bacon to the point of being crispy before crumbling it and adding it to the Spicy Bacon Cheddar Zucchini Breakfast Muffins. It adds a textural interest to the muffin. Are they very spicy? Nope. Not at all. There is a full jalapeno in here, though, so the overall level of spice is going to be dependent upon the heat of the individual jalapeno. If you’re super sensitive to spice, you can replace the jalapeno pepper with a baby bell pepper. To avoid spill-over, only fill your muffin cups 2/3 full of muffin batter. There’s no need to shove the Cheddar into the muffin. Perch the piece of cheese on top of the filled muffin cups. It’ll melt as the muffin bakes and then VOILA! a lovely cap of melted cheese. 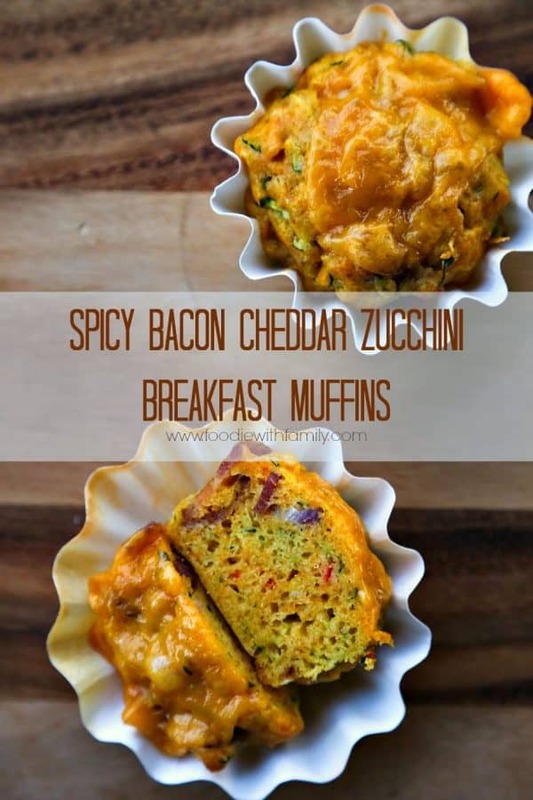 Spicy Bacon Cheddar Zucchini Breakfast Muffins freeze BEAUTIFULLY, so feel free to double or triple the recipe. To freeze them, cool to room temperature then chill in the refrigerator. Lay them out on a cookie sheet and put in the freezer until they are frozen solid. Wrap each individually with plastic wrap then put them all in a resealable zipper type freezer bag. Store in the freezer for up to 3 months. These reheat like a dream. See the recipe for reheating instructions. 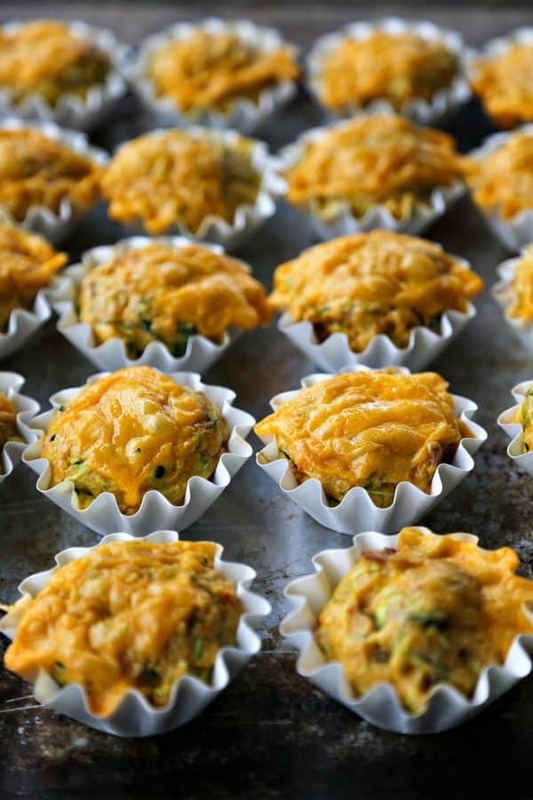 Tender, shot through with crispy bacon, heavy on the eggs, moist with scads of shredded zucchini and topped with a generous cap of melted Cheddar cheese, these Spicy Bacon Cheddar Zucchini Muffins bridge the gap a quiche and a muffin. Adapted from and with thanks to No Recipes. Microwave for 30 to 45 seconds on HIGH. Microwaves vary in their power, so you may need to play with this time a little bit to find what works best for you. Unwrap a frozen muffin and lay it on a microwave safe plate. Cover with plastic wrap and vent one corner. Microwave on HIGH for 1 minute 20 seconds. Because microwaves vary in their power, you may need to experiment a little with this time to find what works best for you. What kind of cupcake papers did you use for the zucchini muffins? Where did you find them? These have my name all over them. I have everything but the zucchini, if you can believe that. I will fix that on my way home this afternoon. Can’t wait to try these bad boys! Will be trying them soon. Love that they are a make ahead option. I’m pinning this to try next week, with some gluten free flour, so the whole family can eat them. Maybe I can sneak some veggies in for breakfast too – if they are paired with bacon. This is just what I want for breakfast this morning! Love the spice, and I know my family would gobble these up – as you know, we love our zucchini! Wow, these sound and look amazing. I’m currently going vegan but do ‘slip’ now and again. My next slip will definitely be with these 🙂 Although I’ll probably eat the entire batch. This recipe looks amazing. Want to make them for our garden fair which is in 2 weeks, using zuccini from my own garden. Are they also good when served cold or is it really necessary yo heat them up?